The mastermind behind the 1972 Munich Olympics massacre, in which 11 Israeli athletes were killed, has died, his daughter and Palestinian officials say. Mohammed Oudeh died of kidney failure a day after he was taken to hospital in Syria, his daughter said. He was 73. Oudeh - also known under his guerrilla name Abu Daoud - did not take part in the notorious attack. He later said he had no regrets because he considered the athletes, as military reservists, to be legitimate targets. Oudeh died at the Andalus hospital in the Syrian capital, Damascus, on Saturday, after being taken ill, Hana Oudeh told the Associated Press news agency. The high-profile and audacious Munich attack, which unfolded live on television, shocked the world. In the following years, Israel assassinated a number of top Palestinian officials whom it believed were involved in the massacre. Oudeh survived an assassination attempt in which he was repeatedly shot at a cafe in Warsaw in 1981. Two Israeli athletes were killed in the September 5 attacks, and nine more died in a botched rescue attempt by the German police. A German policeman and five Palestinian gunmen were also killed. Ms Oudeh said her father was to be buried at the Martyrs Cemetery in the Yarmouk Palestinian refugee camp, in Damascus. Oudeh was "a great, loving and sincere man whose dream was to go back to Palestine", she told AP. 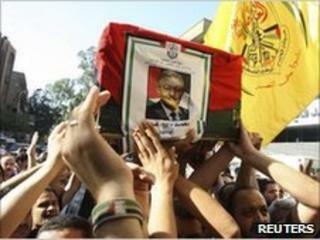 Oudeh was a leader of Black September, an offshoot of the late Palestinian leader Yasser Arafat's Fatah group. The faction had been established to avenge the 1970 expulsion of Palestinian guerrillas from Jordan. In a 2006 interview with AP, Oudeh said the Munich attacks were a turning point for Palestinians. He rejected the term "terrorists" to describe Palestinian fighters, and said: "Before Munich, nobody had the slightest idea about Palestine." Oudeh admitted responsibility for the Munich operation in a 1999 book, Palestine: From Jerusalem to Munich. It caused uproar when it was published, and Israel barred him from returning to the West Bank.